Although Italy’s birth rate is one of the lowest in the world, one small Tuscan town, Quarrata, is turning that around. Last year, there were 256 bambini born in a hamlet of 25,000 — resulting in a birth rate of 10.32, about what was normal in Italy 30 years ago. Aside from increasing schools and day care centers to meet the newcomers, Quarrata — about 20 miles northwest of Florence — also holds a giant collective birthday party in June every year for the town’s kids in a Medici villa called La MagÃ¬a (pictured above). Part of the park grounds have been turned into a playground, too. The villa is a symbol, Gori says, that parents who have kids know they’re not alone in raising them. She believes more Italians don’t have children — the national birthrate is 1.3 — because they have one and realize how hard it is. Unlike other parts of Italy, the increase isn’t just from births by foreigners. Immigrant families in Quarrata are responsible for about 20% of the birth uptick. Mothers in Verona, Italy can pop in to city-run pharmacies the next time they need to breast-feed. They’ll find a quiet back room with a comfortable chair, changing table and bathroom. Thanks to a short training course for pharmacists, they should also find an understanding environment. 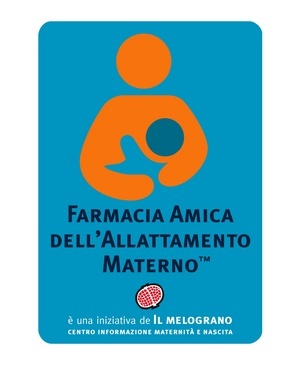 It started when pharmacist Paolo Delfini came into contact with mother’s association Il Melograno, he realized that moms with newborns were often left to fend for them selves. While images of the Madonna Lactans are fairly common, Italy’s birth rate is one of the lowest in the world and Italians seem to be out of the habit of seeing women breast feed. Recently, a mother breast-feeding her five-month-old who was asked to leave a hotel restaurant because the manager said other customers complained made national news. Thirteen pharmacies are currently offering a haven for breast-feeding, organizers hope to convince the national association of pharmacies to participate in the program. There’s one slight flaw in the breast-feed at the pharmacy scheme — most Italian pharmacies usually close at mid-day and on Sundays, so finding one open could be a challenge. 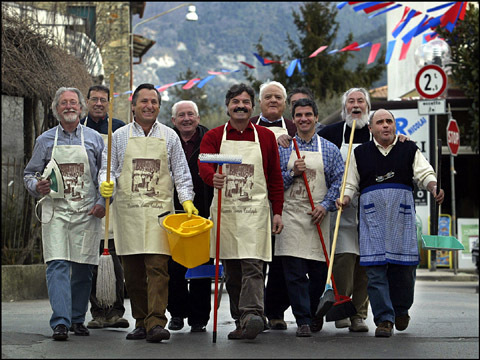 By many accounts, Italian men are some of the laziest in Europe when it comes to lending a hand at home. According to the national association of house husbands, 70% of Italian men never cook, 90% have never, ever, ironed a shirt, 95% have never done a load of wash.
With the financial crisis hitting Italian households, that may change. Some 34% of Italian women have cut back on household help, a recent survey by Coesis announced. They’re also looking to husbands and family to start lending a hand, researchers noted. It’s about time for men to step up and help out, says the house husband association. Born in 2002, the Tuscan-based association, which offers master classes in home management (“the science of ironing,” anyone?) now counts over 4,000 members. I suspect the biggest challenge may be men over 50, who have never helped out and probably don’t see much reason to change that. A lot of younger Italian guys I know are great cooks and decent about taking care of la casa. Does your Italian man help out around the house? Fellow reporter and friend Eric Sylvers is on the road again, this time he and three friends are walking the lower half of Italy’s pilgrim route to where the boats once left for Jeruselem, the Via Francigena del Sud, 500 kilometers (310 miles) from Rome to Otranto, Puglia. While the northern part of the trek — from the Gran San Bernardo Pass in Switzerland to Rome he did in 2007 was fairly well marked, this leg sounds like the epitome of the road less traveled. “Just before Amorosi we had been through a town called Ruviano were we made the acquaintance of Giuseppe, who left nearby Avellino for the United States when he was 19 and lived there for 50 years before coming back to retire to his native Campania four years ago. Colorful Giuseppe kept us occupied for quite awhile and so it was with the slowest of paces that we made our way towards Solopaca, our intended stop for the evening before our push to Benevento tomorrow. www.zoomata.com staff No television means more bambini. The equation seems that simple, at least in a tiny Italian hill town with poor television reception. The 250 inhabitants of Torri, about 9 kilometers (5.7 miles) inland from Ventimiglia in the Liguria region, appear to have turned to procreation as recreation: the percentage of children in the total population, 32%, is more than twice that of the Italian national average. Torri, or towers in Italian, takes its name from a fortified structure built there in 1173. The sheltered mountain position that once made for protection against outsiders now shields the town from TV reception. State broadcaster RAI’s signal doesn’t come through at all while only one channel from commercial broadcaster Mediaset gets through for a few hours if the weather is right. Perhaps politicians and church officials, who have been trying to convince Italians to raise one of the world’s lowest birth rates, should take note. Towns throughout Italy now offer ‘social subsidies’ that grow with the family as incentives. A typical program offers cash for the first five years of a child’s life, doubling for every sibling added to the family.Some of the more whimsical initiatives honoring precious newborns include towns like Moretta, where the main square lights up for each new citizen or Monza, where each family is sent a personalized poem marking the event. Play nice. Please use contact form for reprint/reuse info. Looks like a lot of spoiling in store for the Italian baby boy with four grandparents, eight great-grand parents and a great-great grandma. Nicolas Cristini was born in Sondrio, 37 kilometers (85 miles) north of Milan, to a large brood of relatives who have already presented him with a soccer ball and tiny soccer shoes. The fifth-generation bambino breaks the previous Italian record of eleven surviving “greats” cooing over Sicilian granddaughter Martina Giudice. Cristini is a dramatic example of the changing Italian family — where one of the highest life expectancy rates in Europe meets one of the lowest birth rates in the world — often called a ‘demographic time bomb’ for problems ranging from schools to healthcare to pensions. Zoomata is the brainchild of a bilingualjournalist based in Italy who thinks out of the box. This brain is for hire. Lots of sites in English list ‘Italian’ baby names but many have either names that aren’t really Italian or just plain weird. Try this one in Italian that allows you to choose first letter (‘iniziale’), length (‘lunghezza’) popularity (put yes or no in the ‘diffuso’ field). Northern Italy’s hospitals are overflowing with a bumper crop of newborn bambini after decades of low birth rates. Milan alone counted a record 2,000 stork visits in July and August, an 8% jump over 2002. After similar reports came in from the provinces of Venice and Piedmont, officials started scrambling to plan for this unexpected mini-boom in births. It’s a step in what may be a small turnaround in Italy’s dismal birth rates. The last data available, 2001, also showed a slight uptick — for the first time in almost a decade, the number of births were higher than deaths in the Bel Paese. The profile of less traditional mamma also factors in — officials said more mothers today are closer to age 40 than 30 and many are having children with a second partner, while foreign-born mothers account for 20% of the total. Hard to say whether economic aid or the more or less constant pleas from the Vatican are having a significant effect on increasing Italian offspring. Towns throughout the country now offer ‘social subsidies’ that grow with the family. A typical program offers cash for the first five years of a child’s life, doubling for every sibling added to the family. Some of the more whimsical initiatives honoring precious newborns are bound to cause trouble if the trend keeps up, especially if it doubles as predicted by 2013. Towns like Moretta, where the main square lights up for each new citizen could become a disco-strobe disaster. Or perhaps there’s a full-time job for a bard in Monza, where each family is sent a personalized poem marking the event. Italian e-cards for new babies…. Joining the chorus of cell phones animating Italian beaches this year will be warning bells from a kiddy safety device that works like an electronic bracelet for criminals. In an effort to restore some peace to the burning sand, use of the electronic ‘restraining’ device has been promoted by the local government in Rimini, the Bel Paese’s family beach haven. Why Italy? Indulgent mamme make for some incredibly bratty children — a recent poll of 2,500 travel-industry professionals voted Italian kids the most obnoxious and unruly in the EU. In a country where, according to UNICEF, only 50% of parents reprimand their kids, the ‘crimes’ committed by bambini on holiday range from running and shouting on airplanes, playing in elevators and generally wreaking havoc. “Safe Kid” (perhaps better named tamed kid?) will be used to keep under control the 500,000 visitors under age 10 expected to vacation this year on the 110 kilometers of the Emilia Romagna coast. Parents can set the distance kids are allowed wander from 15-50 meters before the warning bell sounds. Traditional Italian names like Marco, Giuseppe and Francesca are making a slow comeback after what was considered an “alarming” trend of babies in the Bel Paese being named after American movie and soap opera stars. Italians are now back to doling out grandparent’s names or those of patron saints to the few precious bambini they’re having after a wave of Sue Ellens, Naomis, Kevins and Michaels, according to a recent poll by Anna magazine. Back on Italy’s baby-name hit list are classics like Alessandro, Matteo, Paola and Elena. "It was a strong trend, but fortunately it’s going out of fashion ", communications expert Sandra Monti told zoomata. "Parents are looking back to tradition and continuity instead of originality — saving a lot of headaches for their children." Foreign names were a seductive fad and a constant hassle — even though the Italian alphabet recently reintroduced the letters K, J, H, W and X pronunciation was difficult and many parents used improbable spellings like Gessica, Illary — pronounced Elarry — and Gionatan (that’s Jonathan, to you) to make sure fellow citizens could get the sound right. Children were saddled with these trendy monikers for good because Italian courts only allow name changes in very limited circumstances — and having to go through life as Uma or Britney isn’t one of them. An Italian town, drained of population from emigration, will light up the main square every time a baby is born. The initiative to celebrate every much-needed bambino comes from Moretta, a town of about 4,000 inhabitants 30 miles from Turin.It’s the latest of a series of pro-baby incentives launched to convince Italians to have more kids — towns throughout the country now offer ‘social subsidies’ that grow with the family. A typical program offers cash for the first five years of a child’s life, doubling for every sibling added to the family. Hard to say whether economic aid or the more or less constant pleas from the Vatican are having a significant effect on increasing Italian offspring — but for the first time in 9 years the number of births were higher than deaths in Italy, according to the latest data available from national statistics institute ISTAT. No newborn will go unnoticed in Moretta: local mayor Mario Piovano decreed that city hall will sport a blue or pink ribbon in honor of the town’s newest citizen for a week — and the main square will also light up for three hours during the day to let townspeople know and rejoice in the latest addition to the local population. There’s hardly risk of a disco strobe effect in the piazza — last year counted only 37 births in Moretta. "We’re a tight-knit community," said Piovano. "We publicly acknowledge deaths with announcements in city hall but births were basically a private affair. Why not acknowledge and participate in the joy of a newborn and the future of our community?"